Courtesy of Oriental Bird Club: original painting by John Gale. Two new species of owls have been discovered in the Philippines, and a Michigan State University researcher played a key role in confirming their existence. The discovery, which is featured in the current issue of Forktail, the Journal of Asian Ornithology, took years to confirm, but it was well worth the effort, said the paper's lead author Pam Rasmussen, MSU assistant professor of zoology and assistant curator of mammalogy and ornithology at the MSU Museum. "More than 15 years ago, we realized that new subspecies of Ninox hawk-owls existed in the Philippines," she said. "But it wasn't until last year that we obtained enough recordings that we could confirm that they were not just subspecies, but two new species of owls." Announcing the finding of a single bird is rare enough. But the discovery of two new bird species in a single paper is so rare that Rasmussen and the other researchers couldn't recall the last time it happened. The first owl, the Camiguin Hawk-owl, is found only on the small island of Camiguin Sur, close to northern Mindanao. Despite being so close geographically to related owls on Mindanao, it has quite different physical characteristics and voice. At night, it gives a long solo song that builds in intensity, with a distinctive low growling tone. Pairs of owls give short barking duets that start with a growl. They also are the only owls to have blue-gray eyes. 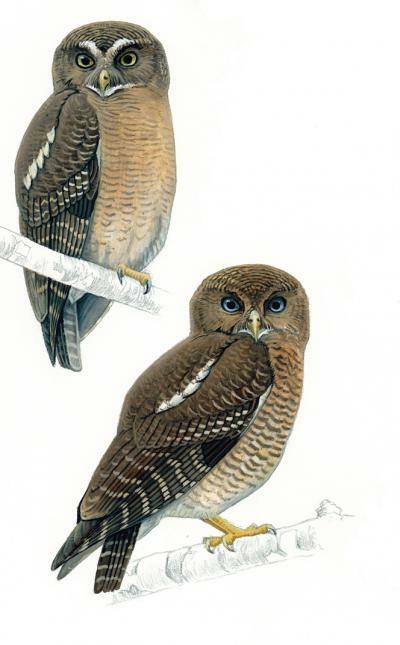 The second new discovery was the Cebu Hawk-owl. This bird was thought to be extinct, as the forests of Cebu have almost all been lost due to deforestation. But it had never been considered a distinct form. Study of its structure and vocalizations confirmed that it was a new species. In fact, it was the unique calling or vocalizations of both owls that confirmed that the new classifications were warranted. "The owls don't learn their songs, which are genetically programmed in their DNA and are used to attract mates or defend their territory; so if they're very different, they must be new species," Rasmussen said. "When we first heard the songs of both owls, we were amazed because they were so distinctly different that we realized they were new species." The owls have avoided recognition as distinct species for so long because the group shows complex variation in appearance that had been poorly studied, and their songs were unknown. Both islands are off the beaten path for ornithologists and birders, who usually visit the larger islands that host more bird species. Sound recordings of both new owl species and those from other islands are available free on AVoCet. Since the discovery process is both tedious and time consuming, it took a team of scientists and contributors to confirm the owls' existence. The team included individuals from BirdLife International, the Oriental Bird Club, Philippines Biodiversity Conservation Foundation Inc. and Birdtour Asia. Additional support was provided by National Geographic.